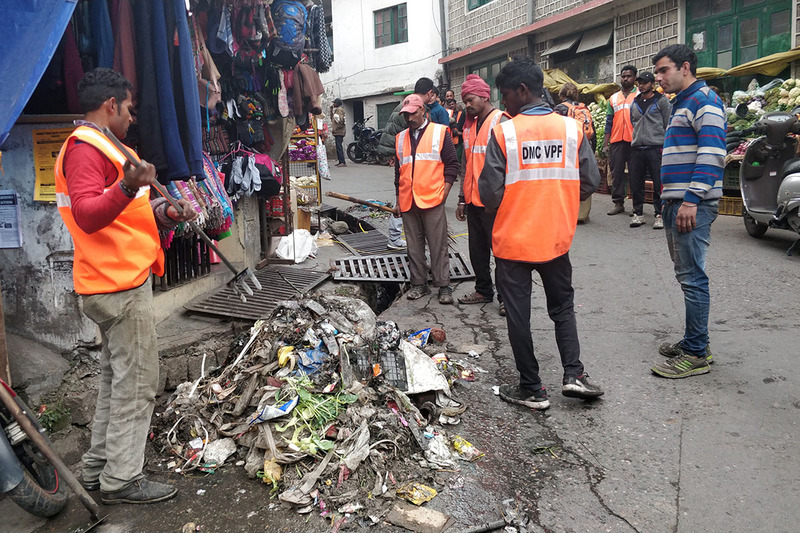 The cleaning squad of the Municipal Corporation Dharamshala scooping out debris from a drainage in McLeod Ganj, India, on 27 November 2018. Local authorities are at last taking the initiative to clean up McLeod Ganj. For the last two days Surindar Shukla, the Sanitation Supervisor of Municipal Corporation Dharamshala, has been overseeing the clearing of all the blocked drainage in the area. Speaking to Tibet Sun, Shukla said that there are proposals to improve the infrastructure in McLeod Ganj. The Municipal Corporation will make some decisions on building better garbage collection and recycling systems. “We may implement door-to-door garbage collection in the New Year,” Shukla said. In the plans are a bio-degradable composting site in McLeod Ganj, with plastic waste to be recycled at a site in Dharamshala. “We also tried to get sites at two other locations, but the locals resisted,” he added. Shukla said there is also the manpower problem. “I am supervising the sanitation of the entire Dharamshala area,” he said — a large area, from Naddi to Sidhbari, and up to Sakoh village on the East. Dharamshala is situated at 1,457 m (4,780 ft) above sea level, and covers 27 km2 (10.66 sq mi), with a population of about 55,000. McLeod Ganj is one of the suburbs of the municipality. It was chosen to become a “Smart City” under the Government of India’s scheme to develop 100 Smart Cities in India. In the foothills of the Himalaya, McLeod Ganj, once a quiet and remote village, became a global tourist destination after Tibetan spiritual leader the Dalai Lama and his administration, now called the Central Tibetan Administration, made it their home in exile. McLeod Ganj in the last few years has become a favourite spot for day trippers from neighbouring states such as Punjab, Haryana, Delhi, and Jammu and Kashmir. In order to ease the traffic a new ropeway is being built from Dharamshala to Temple Road. The shops and buildings in the middle lane running from the main square may have to be demolished, except for the Buddhist stupa with the prayer wheels. “The law is that buildings should be three metres away from the drainage. But who is following the law?” Shukla quipped. Thank you Mr Shukla and your team for the great work. Despite the popularity as being the home of the Dalai Lama and CTA, it has always been neglected as no politicians live here. The roads, the traffic, garbage and the lack of planning is making this place ugly and unpleasant. As someone living in McLeod Ganj, I am happy to learn that MCD has plans to take care of the prevailing problems. The garbage control should be the priority, and may be followed by the traffic flow, and making it a no horn zone. There should be a cap on the amount of constructions taking place in McLeod, and those that are already build or under construction should be checked whether they are within the purview of what’s legal and permissible. Right now, the situation is such that with one earthquake the whole of McLeod will be flattened. I liked the idea of the rope ways. But didn’t understand why building it so close to the Dalai Lama’s residence. It’s obvious that the planners of this project do not live here. This is the problem when the locals are not taken into confidence. It could have been below the bus station or even a bit further from there. The idea to demolish the middle-lane shops and buildings is a very good idea. Some are not even three metres from any side of the drainage. This will relieve McLeod from a huge congestion. The entire area from the Main Chowk to Dolma Chowk should be made into a plaza. McLeod Ganj drainages are being cleaned up!!! But…. wait… i read middle lane shops will be domolished for sewerage!!! No need to do this MC (Corporation). Make McLeod Ganj four wheelers free or walking plaza. Demo midlane shops will make McLeod Ganj less beautiful.